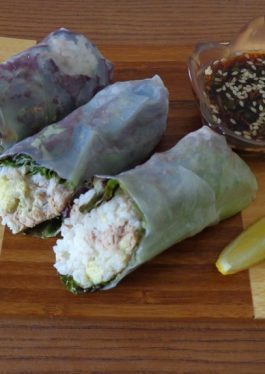 Check out this delicious Avocado Tuna Rice Spring Rolls with Poke Sauce recipe from VeeTee member Hidemi Walsh and the story behind it: My diabetic husband loves sushi and deep fried spring rolls but those are not so healthy. To satisfy him, I created this recipe. Not only to make it healthy, but also to enjoy the taste of each ingredient and the dipping sauce, I made these simply. For the sauce, I got inspired by Poke. Very refreshing, guilt free, gluten free and health benefits packed meal. 1. Cook rice following by the package directions then transfer into a bowl. 2. Halve avocado, pit, scoop avocado flesh out and dice small. Then put into the rice bowl with tuna. Mix to combine. 3. Prepare the rice papers following by the package directions. 4. Make roll one by one. 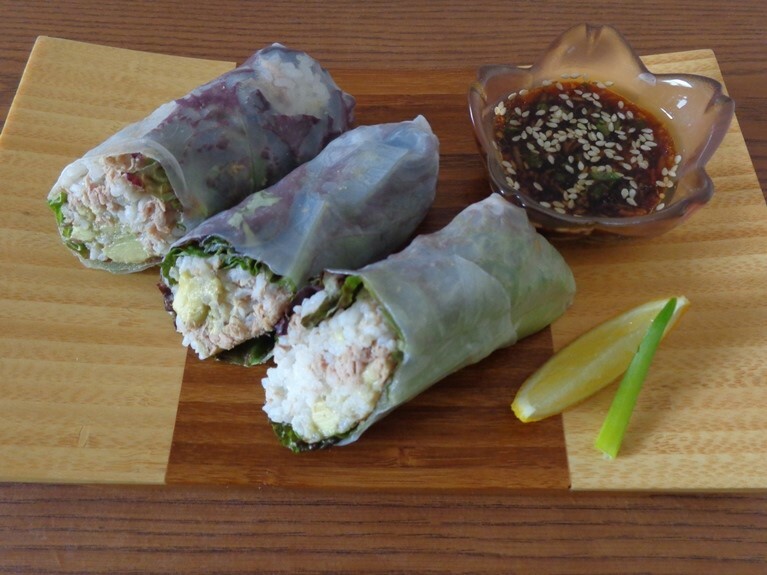 Place one rice paper on a work surface or cutting board. Place one lettuce leaf on slightly below the center of the rice paper. Spread 1/6 of the rice mixture on the lettuce. Fold the bottom over the mixture tightly and pulling back a little bit. Fold right and left, and roll it up tightly. Set the roll, seam side down, on a plate. Make 5 more rolls with the rest of rice mixture, lettuce leaves and rice papers. 5. Make dipping sauce. In a bowl, mix together soy sauce, mirin, sesame oil, grated garlic, lemon juice, sesame seeds and scallions. 6. To serve, cut each roll into half diagonally and serve with the dipping sauce.